The ideal way of presenting this would be to have the two recordings presented next to each other but, well, my filing system isn’t all it could be and so far I can only find six of the recordings from 2009. So here’s the first recording from 2019. I cleaned the dishwasher recently and for whatever reason the sound it makes has changed considerably. To listen to the sound of grassroots football matches on parish recreation grounds, playing fields and village greens is to listen to the fleeting traces of a rich sounding culture. The iterative ritual of marking out the pitch, cutting the grass, fixing nets to goalposts with cable ties and driving corner flags into the earth. Then the distinctive practices of on-pitch communication; the whistle; the sound of football boot on ball, of the ball as it lands; the struck crack of the crossbar; studs compressing the soil, brushing the grass, slicing through the turf. Grassroots football is a game of noise, silence, presence, absence, activity, inactivity. The sounding comes in waves — building, receding. Pitches stand empty for days then startle into exuberant sound-making action. Football is present. Football is happening. A substitution is made; the ball takes a wild deflection from a corner — disappears into a garden — and is followed by a player who climbs over a fence and into undergrowth to retrieve it; a free-kick is given and the game stalls; the goalkeeper argues with his left-back about how many players should be in the wall; the central defender argues with the ref about the infringement; the assistant referee checks his phone for messages. There’s an injury and the players stand around in small groups talking or lost in their own thoughts. Then the game crackles into life with a high tackle; a controversial decision; a header that slaps against the post; a counter-attack; a coach barely able to prevent himself from running onto the pitch and who, instead, ends up kicking the dugout. The final whistle. The everyday sounds of the parish recreation ground, playing field and village green return. Football is absent. Football isn’t happening. I made this recording on my second visit to Fortescue Farm standing next to the seven bar gate at the former site of a ford across the exe. The river was running within its banks but was still very fast flowing and swollen. Several times during the recording you can hear trains passing on the mainline between Exeter St. David’s and Taunton and in the distance you can hear the sound of an excavator somewhere near Stears Cottage to the North of Stoke Cannon. Recently I have begun thinking that rather than record at the field I should consider how to create a permanent audio stream to the site perhaps because I see my recording activities not as creating documents of a specific moment – although they do – but of making the soundscape of the location audible beyond our boundary of encounter with the site. I’m looking forward to returning to the seven bar gate in April to see how the soundscape has changed in that time. While I was making this recording I walked West across the site taking photographs of the remains of driftwood scattered across ‘third marsh’ and material that had become lodged against wooden posts of the fence that separates ‘second marsh’ from ‘third marsh’. On April 16th I visited the site with Emma Welton. As we walked away from the relative shelter of Fortescue Farm it became evident that strongly gusting wind was going to be a strong feature of the day. The wind cut across the site making the sound of the wind in my ears the most prevalent sound of day. This always seems amplified when wearing headphones as the wind is channelled through the gaps between the headband and the earpieces. There’s very little shelter on the site until you get to the copse of trees in rough marsh so this made recording very difficult even with a blimp. We heard all manner of aeolian phenomena during the day including the crackle of dry grasses; the tapping of tree branches as they are pushed around; the flutter of boundary tape; and the rush of white noise as the wind got amongst the grass in rough marsh. The most distinctive aeolian phenomena of the day was the sound made by the passage of the wind through small holes in the new gates that had been installed to replace those damaged in the flooding earlier in the year. We set up next to one of them and spent some time listening. Later that day we worked with the violin in the centre of one of the fields and listened as the wind activated the strings. These two recordings made with hydrophones (Aquarian Audio) provide different perspectives on the River Exe in flood. The first is one of the first recordings that I made as part of somewhere a field in January 2013 whilst the second was made in May 2014. 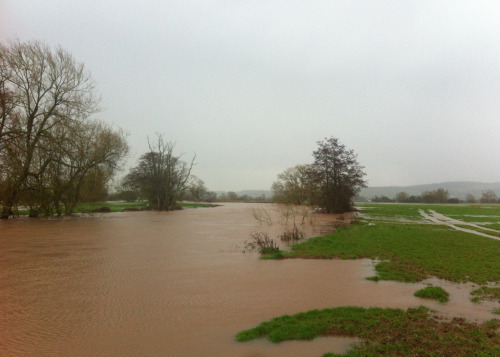 During many of my winter visits to the field in the first two years of the study the River Exe was either lapping at the top of its banks or was spreading out across the fields. This is a recording i made on my first visit to Fortescue Farm. The River Exe was in flood and had swept away parts of the river bank and there was driftwood scattered across the fields. Riverside fencing had been washed away by debris and it was hard to tell where the river ended and the fields began. I used two hydrophones to make this recording. One of them i cast as far out into the River as i could whilst the other was closer to the bank. The river was moving very quickly and in the recording its possible to hear the clatter of small stones as they are swept along past the hydrophone. …the River Exe was just beginning to break its banks. As I arrived the water was seeping into First Marsh. By the time I left several hours later their was a foot of water across the field flowing swiftly towards the River on the other side of the fields and short circuiting the passage of the Exe – making small islands across the landscape. As the River rose I placed a hydrophone in the soil and listened. As soon as the banks were breached the water sped down the slope and eventually created a channel across the site linking up with the Exe again as it headed North West towards Brampford Speke. The sonic advent calendar is making a return this year, and will be meditating on thresholds and transitions of varying sorts. You can listen to the sounds as they appear day by day here.